Map, References / Sources found on intro. Hanna was born in Warsaw, and married in 1937 to Wachtang Abaszidze, a Captain of the 13th Division of the Polish Army. She is a distant relative of my wife, whose family history I am researching. I hope this post may generate some additional info about Hanna. Wachtang was Georgian, having fought in the Russian Civil War 1917-20 on the White Russian side, and escaped via Constantinople to be recruited into the new Polish Army. Captured in September 1939, he was released in December 1939. Hanna and Wachtang passed the war in Warsaw, but so far as one can gather they drifted apart towards the end. Hanna managed to get away from Warsaw before the Uprising broke out on 1st August 1944, and at the end of the war found herself in the area east of Munich. 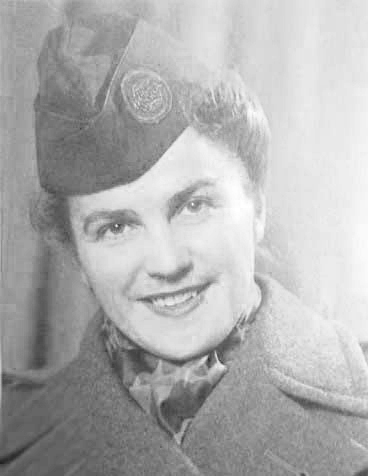 As she spoke several languages fluently, she quickly found herself employed by the American forces as an interpreter, and then soon joined the International Refugee Organisation as a welfare officer (see photo below). She worked in various camps from 1945 to 1950, so far as I can identify, as follows: Hammerau, Murnau, Freilassing, Laufen, Ainring and Bad Reichenhall. She was employed at Bad Reichenhall twice, and this was her last posting when on Saturday 13 May 1950 she drowned in a river above Bad Reichenhall trying to save the dog of a friend which had fallen into the river. She had a very large funeral, and people came long distances to attend. She would have been very well known in the camp network, being an outgoing and gregarious personality. She was buried at St Zeno Church in Bad Reichenhall, where a stone on her grave was maintained by someone until about 2006. I found the site of her grave a few years ago. I have asked for this information to be posted on the Dpcamps website in the hope that it may ring bells with people interested in any of the camps listed. Maybe fragments of information exist here and there which will help me build up a richer picture of this young woman whose life was cut off so prematurely. Minden (a city in Westphalen region) is the closest city where you can find archives. Lahde in now a community (See also: http://www.lahde.de), part of the city of Petershagen (see http://www.petershagen.de/ ). Book: Heymont, Irving. After the Deluge: The Landsberg DP Camp, 1945. McLean, VA: Gen Rsrch Corp, Jul 1981. 195 p. D809G3H49. Diary of camp commander, 19 Sep-7 Dec 1945. Submitted by: w.strobel@netcologne.de, author of Post der befreiten Zwangsarbeiter - Displaced Persons Mail Paid in Deutschland 1945 - 1949. Landshut has its own page.  In Landshut in summer 1945, over 2000 Displaced Persons were accommodated. By middle of 1946, the number arose up to 3000 persons - then it became slowly dwindled to less people (page 45). - for the IRO 30 houses with 141 flats and 603 rooms (page 47).  On May 23rd 1945 Seligenthal, Zisterzienserinnen-Kloster Seligenthal (a nunnery school or convent in Landshut), was confiscated by the US-Army for accommodating 1250 Polish Displaced Persons. On July 17th/18th 1945 the Displaced Persons were transported to a camp in Oberpfalz (another district in Bavaria) (page 163).  Hoehn-Kaserne (Hoehn Barracks), former names were Schwerreiter-Kaserne and Max-Zwei-Kaserne:This must have been a huge building, but it does not exist anymore.  Other camps were in: the sports hall in Wittstrasse (Witt-street) and in the government building (page 44).  There were DP-Camps in many schools from the city and district and the schools of Seligenthal (page 153): In the Boys' School was a Lettish DP camp from fall 1945 (page 160) and in the Elementary School was a Polish DP camp also (page 159). The Jewish Community`s DP camp was in a guesthouse: Gasthaus "Zum Silbernagel (page 43).  DP-Camps in confiscated private houses: in villas at Annaberg, the residential areas at Hammerbachweg, in Clemens-Brentano-Strasse Mitterwoehr, at the Niedermayer-Strasse (page44). I was just looking thought your amazing website and thought I might contact you in regards to finding family histories. My grandparents were (as far as we know) from Polish/Ukranian heritage. My grandmother Helene Kucharyk gave birth to my mother in Laupheim Germany. She then emmigated to Australia from Bremerhaven, with my mother and her sister Helene. My grandfather Terenty Morhulski/Morgulski travelled to Australia from Naples. Do you know how I can find out about their lives prior to leaving Germany/Italy? Any websites or links would be truly appreicated. Lebestedt has its own page. This seems to be a research project on forced labor camps in that region. Perhaps you can try to get information there. Submitted by: Wolfgang Strobel, author of Post der befreiten Zwangsarbeiter - Displaced Persons Mail Paid in Deutschland 1945 - 1949. Lentersheim / Lendersheim photos of the town available here. 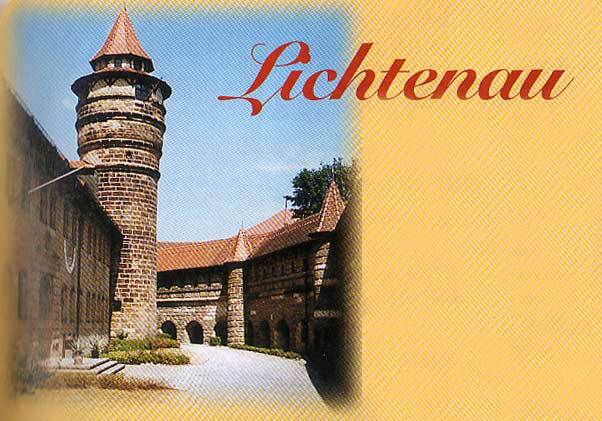 I talked to the guys in - Lentersheim. They say, that they have the regular registers quite complete (but not much further) and they told me of an afterwar-camp at the Hesselberg, where DPs stayed there only for short time, and then they were sent into 'private houses' like in Lenningen or Dinkelsbühl. 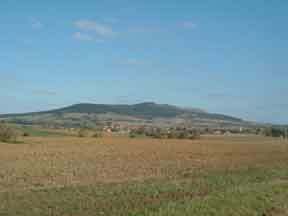 I was on the Hesselberg nearby; it is a wonderfull hill, marvelous sight to all the area around. I asked a woman for details. 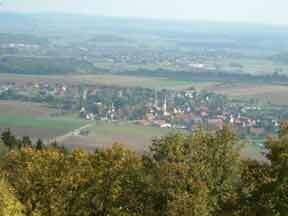 She said: "The Hesselberg was a fortified place in the very early days of history. One still can see today the remains of the walls of the fortification. The Nazis wanted to have this impressing hill as a part of their propaganda and claimed him "The hill of the Franks (Franken is the name of the region)" and started to build there a school which never was finished." I was at a DP camp call Liam, which apparently was small and comprised of Ukrainians and Lithuanians. I can’t find any reference to it on the website. Do you have any suggestions where I can find information about this DP camp. My mother and I were “traveling” with her in- laws and were with them in Laim. My grandfather was a Ukrainian Catholic priest, Rev. Andrew Treshnewsky. I have to tell you that I was so surprised that there is a website dedicated to this subject. Surprised and pleased! Mühlenteich is a different camp in a different town, namely Oldenburg (Oldb), see letter O. In Lingen (Ems) a Polish Camp existed from about August 1945 to June 1947. From January 1949 to June 1950 there was a Yugoslav camp "Dover" Gelköstenstiege and a second camp named Essex camp. Wolfgang Strobel author of Post der befreiten Zwangsarbeiter - Displaced Persons Mail Paid in Deutschland 1945 - 1949. Good luck for all your work! "The barracks at Lingen was on four sides of a barrack square. Memory has the number of occupants as Russians 8,000, others 6,000. The Russians, comprising men, women and children of all ages were under the brutal control of a self-appointed Commissar who had his staff, bodyguard, and executioners. He has his own guard at the only gate, alongside the A Squadron guard. The language problem created very great difficulty and the arrogance and insolence of the Russian command brooked no interference. For the small A Squadron party control was superficial and only a brave or foolish man entered Russian controlled buildings. No member of A could forget the daily disciplinary court which was held by the Russians on the parade ground opposite A Squadron quarters. In view of all the Russians, who were commanded to be there, wretched people guilty of some offence were tried before the Commissar and dealt with. The platform at the edge of the square had a crude gallows permanently mounted on which regularly someone was put to death. Gunshots were often heard - it was seldom possible to tell if someone had been shot, though this was likely. As the Russian guards were so heavily armed nothing could be done, though protests were made. Good to hear from you. Yours is a very interesting story, and you seem to be doing good work. I wonder how much of my war writings you have read. Three chapters (about 47,000 words) were on my regimental website. (http://www.9thrtr.com). Our Archivist told me that it was being discontinued (because we are all too old to maintain it) but that the Tank Museum at Bovington were to take it over. My writings included the D.P. camp at Lingen on the Dortmund-Ems canal, and also problems in the Harz Mountains where ex Polish D.P. 's were holed up in the hills and descending at nights (winter of 45/46) to pillage villages, and assault the population. 9 R.T.R. for a time had to go out on night patrols, selecting villages at random to 'occupy'. If the Poles knew we were there they generally kept away, but there was some confrontation and a mate of mine was asked why we were protecting the enemy. They did not accept that the war was over and the Germans were entitled to peace. While at Lingen some of us had contact with the D.P. 's, mainly young girls. I remember saying to two how wonderful it would be for them once they were sent home, and they, being Russian [Olga's comment: Ukrainians required to me listed as Russians or Soviets], were petrified at the thought. They knew they would be killed by the Russians - but we could not understand this. Many years later I came across a book "Victims of Yalta" by Nikolai Tolstoy. My copy is dated 1990, so I don't know if it can still be bought or seen in a library. If you haven't seen it, it tells how 2,000,000 D.P's [Ukrainian] were returned to torture and death in their homeland.